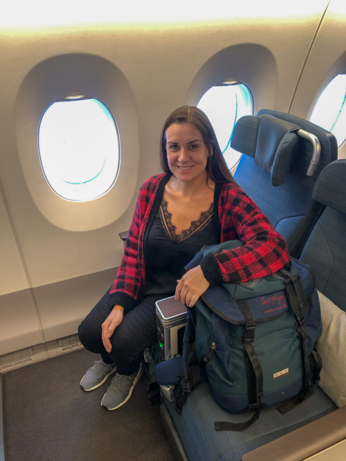 Cathay Pacific Premium Economy cabin review. 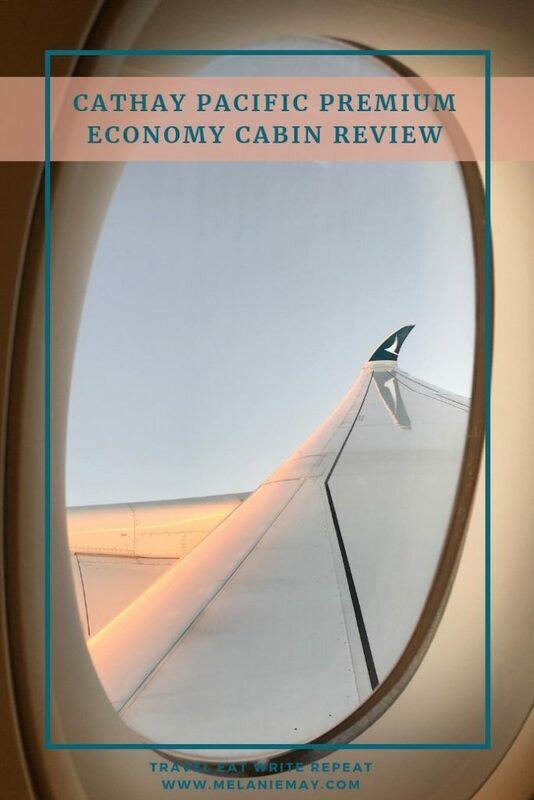 I’ve also written a review of the Cathay Pacific Business Class Lounge. 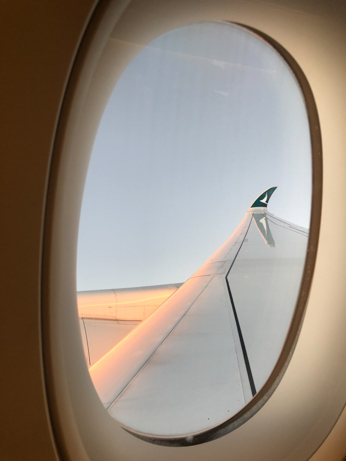 In December 2018 I travelled to Hong Kong with Cathay Pacific. I booked return economy tickets on the Cathay Pacific website and it cost roughly €560. I then contacted Cathay Pacific and asked if they would like to collaborate with me on this blog. Cathay Pacific agreed. In return for some coverage and social media posts (see my Instagram highlight) I received a free upgrade to the Premium Economy cabin. The price of the Cathay Pacific Premium Economy ticket was about €1,000. So, if I was to pay for the Premium Economy ticket it would have cost me around €500 more than the economy ticket. 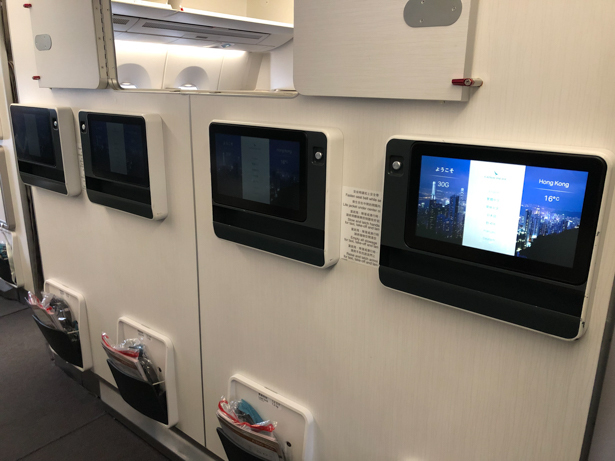 The differences between Cathay Pacific Economy and Cathay Pacific Premium Economy tickets. With a Cathay Pacific economy cabin ticket, you have to pay to pre-select your seat. 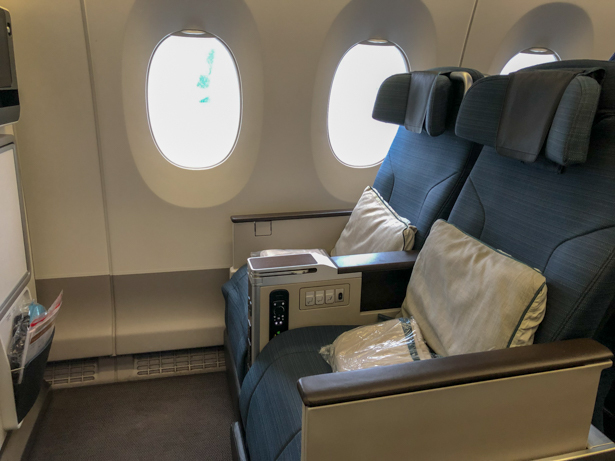 With a Cathay Pacific Premium Economy cabin ticket, you don’t have to pay to pre-select your seat. A Cathay Pacific economy cabin ticket gives you 30kg of checked luggage. A Cathay Pacific Premium Economy cabin ticket gives you 35kg of checked luggage. With a Cathay Pacific Premium Economy cabin ticket the fee to change your booking is less. You also get more Marco Polo Club points and Asia Miles. As Cathay Pacific is a Oneworld alliance member you can collect air miles for other Oneworld alliance airlines. For example, I collected British Airways tier points and Avios points for flying with Cathay Pacific. However, I only collected them on the outgoing part. I forgot to add my British Airways Executive Club membership number to the return flight. You cannot transfer your points over from Cathay Pacific/Marco Polo/Asia Miles to BA Executive Club. So, make sure you don’t make the same mistake I did and add your relevant air miles programme to the flight booking. Then, when you are checking in, make sure they add the number again, just to be on the safe side. 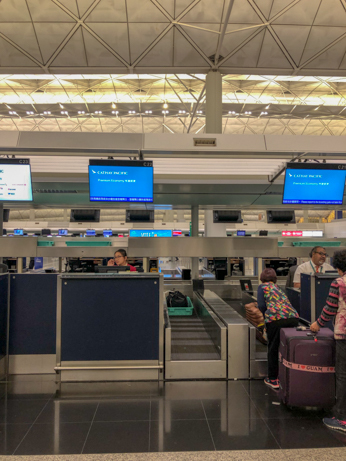 At selected airports, there is a separate queue and dedicated check-in desks for Cathay Pacific Premium Economy ticket holders. This minimises queuing time. They have these desks at Dublin and Hong Kong airports. 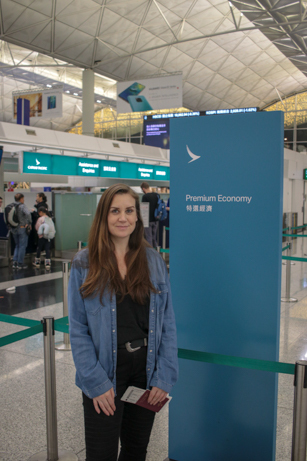 Cathay Pacific Premium Economy ticket holders also get priority boarding and board the aeroplane before economy passengers. 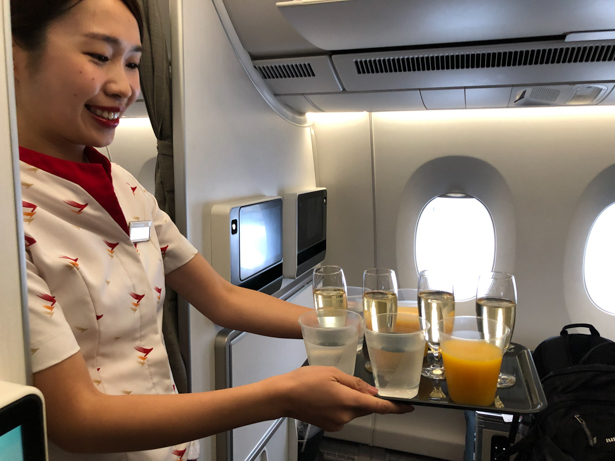 As soon as you board, passengers in the Cathay Pacific Premium Economy cabin get complimentary drinks – Champagne, water or orange juice – and then a snack straight after takeoff – a small packet of smoked almonds and a drink. 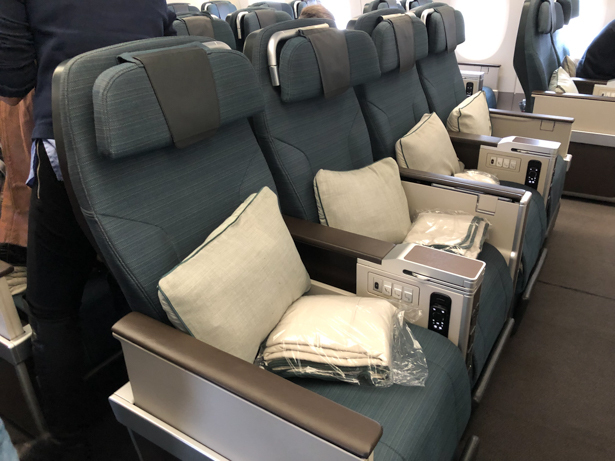 The Cathay Pacific Premium Economy cabin on the Dublin to Hong Kong non-stop flight CX306 and Hong Kong to Dublin non-stop flight CX307 on the Airbus A350-900 is in a 2-4-2 layout. On these flights, there are 28 Premium Economy seats and 214 economy seats. With so few seats, the Premium Economy section is nice and quiet. A curtain sections off the Cathay Pacific Premium Economy cabin from the Business Class and Economy Class cabins. Premium Economy passengers get a large pillow with soft cover and a super soft blanket that is more like a summer duvet. It is so cosy. They also get on-ear headphones and an amenity kit which has flight socks, a toothbrush and toothpaste, earplugs and an eye mask. You don’t really need the eye mask at all as the lighting is always dim and relaxing the Premium Economy cabin. My seat was 30K, a window seat, naturally. It was at the bulkhead and when sitting here, you cannot have any hand luggage at your feet for takeoff or landing. However, if I was flying in the Premium Economy cabin again this is the seat that I would choose. I think row 30 seats A, C, H and K are the best in Premium Economy. 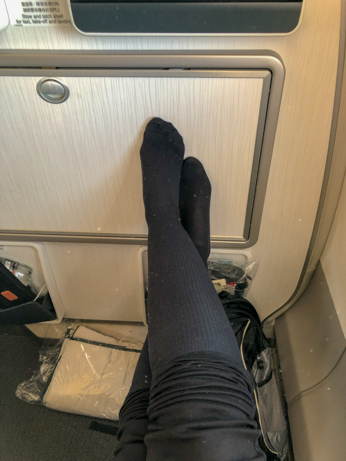 I loved my seat because of how much leg room there was, I could barely touch the bulkhead and how much more floor space there was so I could spread my things out. They really were very spacious indeed. Probably the best thing about the Cathay Pacific Premium Economy seats is that they recline so far back. The leg section raises up and there is a footrest that lifts up too. This means you are in a really comfortable position for sleeping. The Premium Economy seat pitch is 40 inches. The Economy seat pitch is 32 inches. The Premium Economy seat width is 20 inches. The Economy seat width is 18 inches. I have to admit, as I am 164cm (5’4”) tall, leg room is never really an issue for me when flying. However, having all that space around me and being able to stretch my legs out up against the bulkhead was wonderful. It made the flight so much more enjoyable and comfortable. 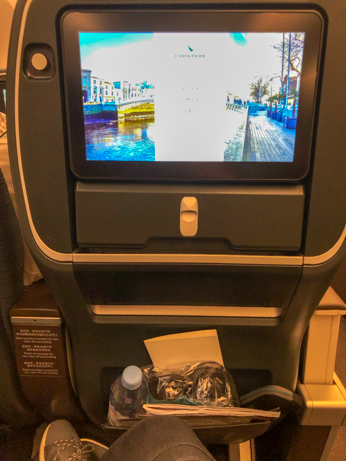 Each pair of seats in the Cathay Pacific Premium Economy cabin gets two adaptable 110V plug sockets and two USB ports. 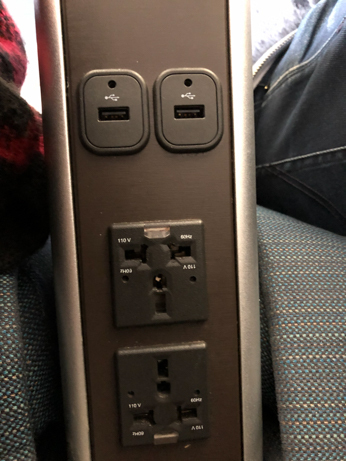 Each seat has headphone jacks. Those sitting at the bulkhead have their TV screens fixed to the bulkhead and have good-sized trays in the armrests. This was actually much more convenient for working on a laptop than having a tray on the back of the seat. The TV on the bulkhead was also a lot easier on the neck and eyes. There is also a pocket on the bulkhead to hold items and magazines. Seats not at the bulkhead in the Cathay Pacific Premium Economy cabin have trays also in the armrests but the tv screens are on the back of the seat in front of you. These seats also get deep pockets in the seats in front of them too. 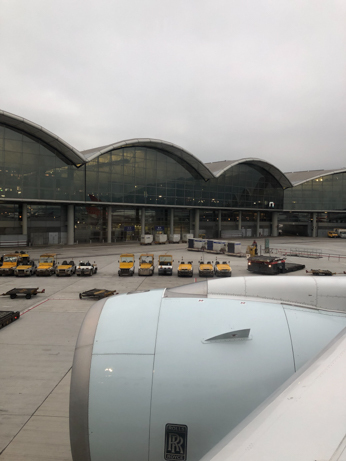 On the return flight, I sat in a regular, non-bulkhead seat and the experience wasn’t as pleasant as the outgoing flight. The seats didn’t have as much space around them and there just wasn’t as much leg room. However, it was still way more comfortable than Economy seats. 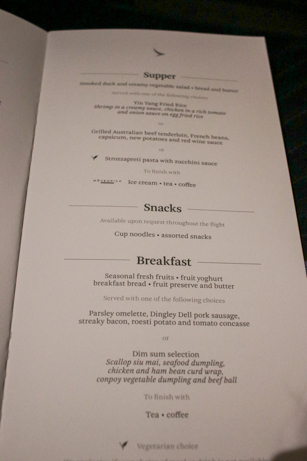 In terms of food, those in the Premium Economy Cabin get a menu and choice of meal. 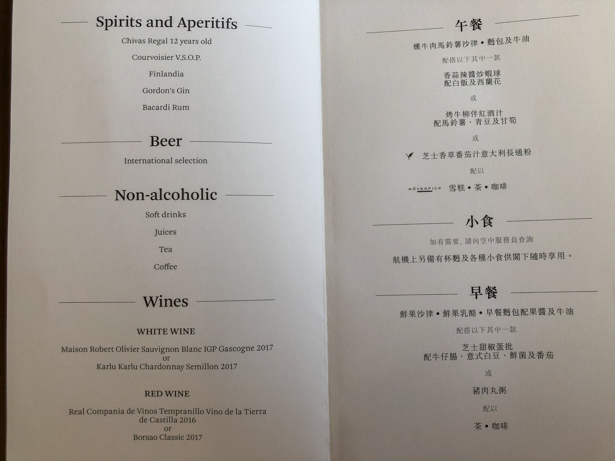 I am assuming this is the same for Economy passengers too but the Cathay Pacific website says that different food options are available in the different classes. All I know is that most of the food in Premium Economy was of a goodish standard. 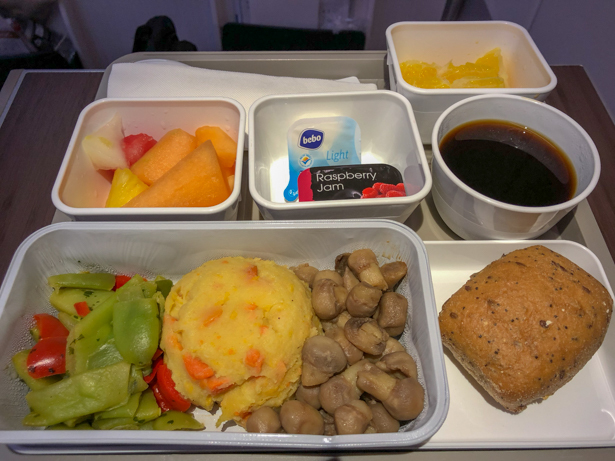 I ordered the vegetarian meal (you need to pre-order you specialist meals before your flight) and both the lunch and breakfast were filling. My vegetarian meal was a small salad of cherry tomato, cucumber and lettuce and there was a brown bread roll and the main was pasta with spinach, mushrooms and pepper. The main meal was a bit watery and flavourless but I am not the biggest fan of pasta anyway. But it really could have done with some seasoning. 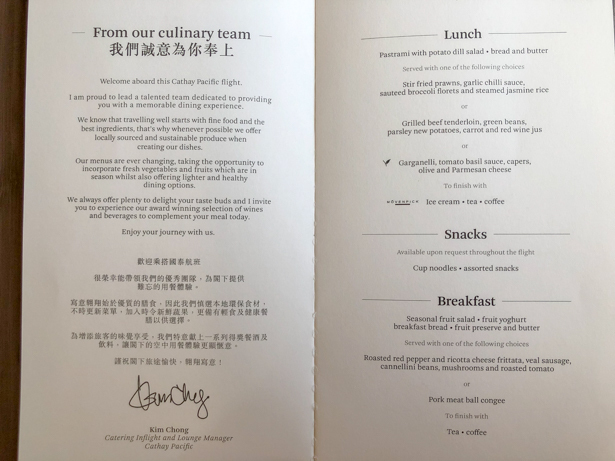 However, they did give me margarine instead of butter and raisins instead of chocolate, so I think Cathay Pacific treat vegan and vegetarians the same in terms of food choices. 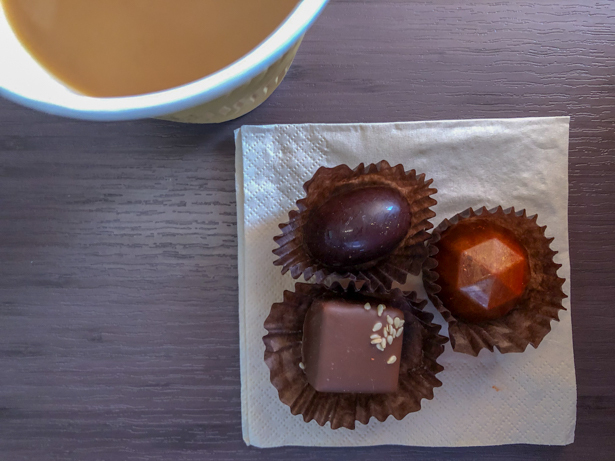 However, after the lovely staff heard my cries of woe over the lack of chocolate they brought me three fancy chocolates from the Business Class food service. This made me very happy. 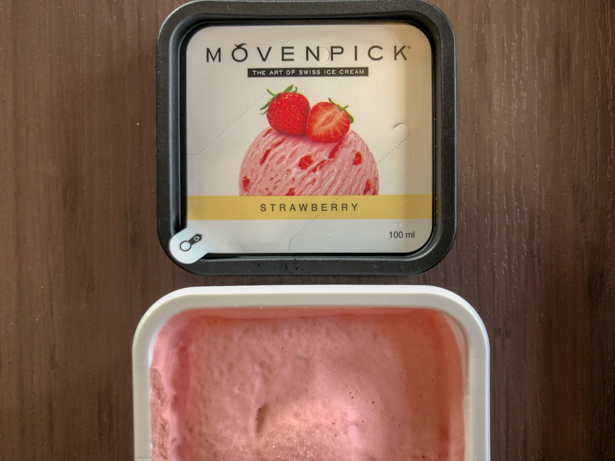 Dessert was strawberry Movenpick ice-cream. Breakfast for me was two servings of fruit – orange segments and fruit salad – a gluten-free roll (even though I am not gluten intolerant), margarine and jam and mushrooms, veg and mash potato. Again, it was grand but lacked a little flavour. The meal came with a choice of juice and tea or coffee. The non-veggie breakfast was a roasted red pepper and ricotta cheese frittata with cannelloni beans, mushrooms, roasted tomato, veal sausage, croissant, fruit, yoghurt, juice, tea and coffee. Again, I really wanted a croissant but for some reason, it doesn’t come with the vegetarian breakfast. 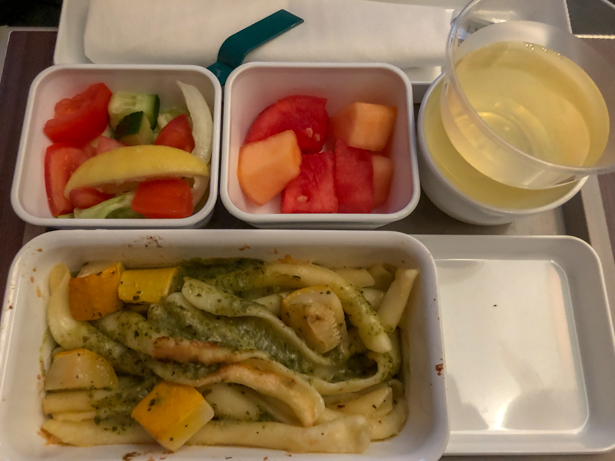 On the return flight, the supper was another small salad, a small serving of melon and something so forgettable that I forgot what it was. I can’t even make out what it was from the photos but the menu tells me it was Strozzapreti pasta with zucchini (courgette) sauce. From recollection, I didn’t eat the main part of this meal as I just didn’t like it. It lacked texture and flavour. I washed the meal down with wine and followed with coffee and strawberry Movenpick ice-cream. 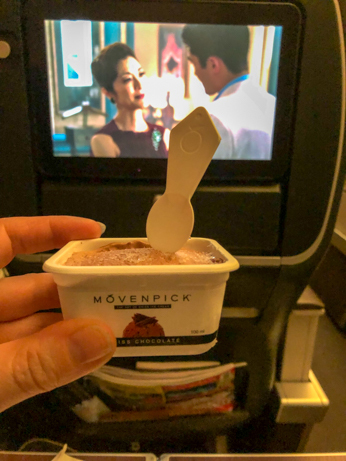 The breakfast on the return flight in the Premium Economy cabin was a lot better. It was fresh fruit salad, brown bread roll, jam and butter and an omelette with roasted cherry tomatoes and rosti potatoes. Again it was filling but some sauce to go with it would have been nice. 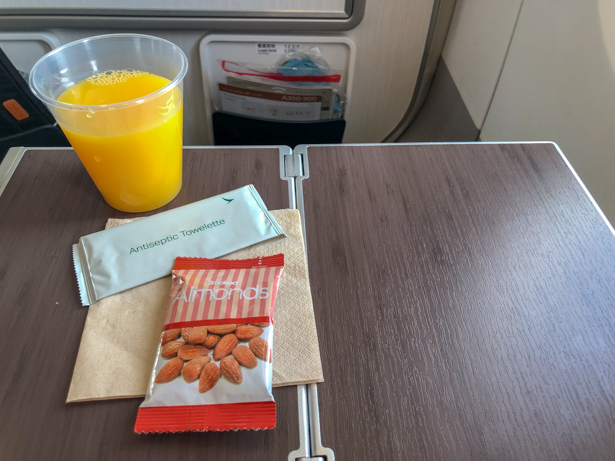 Throughout the flight, you can ask for soft drinks, alcoholic beverages and hot drinks as well as snacks. You can get pot noodle onboard. 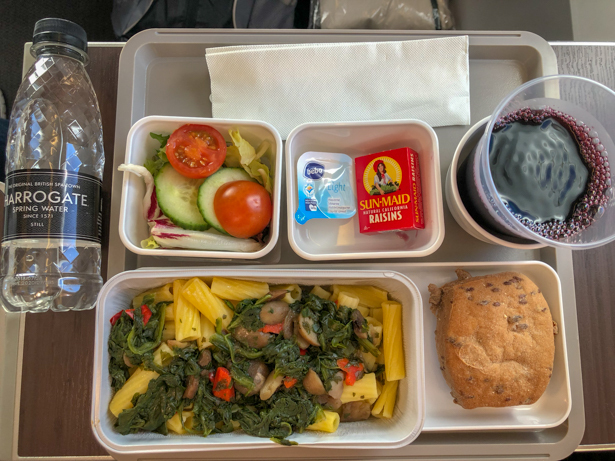 Overall, there was a good amount of food – I never felt hungry – and there were some nice fresh fruit and yoghurt and a good amount of vegetables in the vegetarian options. However, everything was just a little bland for my taste. The best thing about the Cathy Pacific Premium Economy cabin was how quiet and dark it was throughout the flight. The cabin crew did their best to sneak through the cabin without disturbing anyone and there were very few announcements from the cabin. This, combined with the snuggly blanket and reclining seat means it is very easy to get a good sleep. Also, because there are so few Premium Economy passengers there is less chance of you being disturbed by your fellow passengers. On the outgoing flight, there were only about eight other passengers in the cabin. That did help keep noise levels down to a minimum. 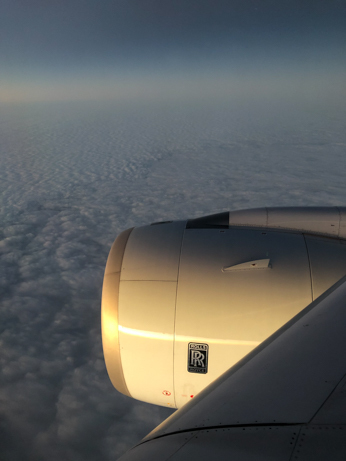 Having said that, on the return flight there were two children in the Premium Economy cabin and they cried for what felt like was the entire flight. And, alas, nothing can be done about that. When you need to go to the toilet you have to go back into the Economy cabin. It is only after being in the cocoon of the Premium Economy cabin do you realise just how cramped and on top of each other Economy passengers really are. When I got back to my seat I vowed to only flew Premium Economy (when available) from now on. But then I remembered that I am not rich so it is most likely that I will never get to fly this way again unless I get lucky with a free upgrade. 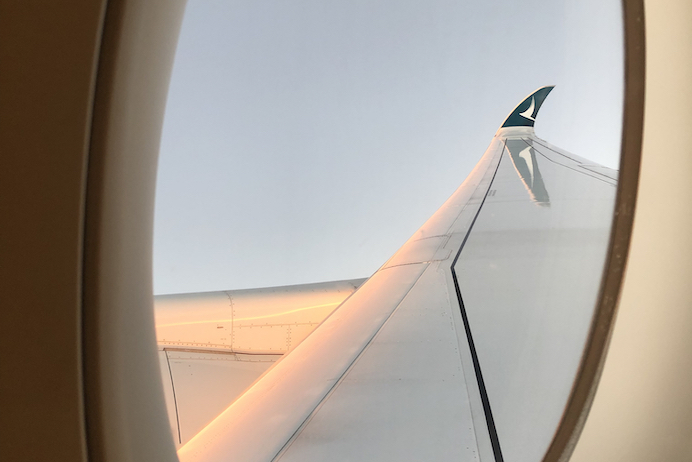 Is Cathay Pacific Premium Economy worth the extra money? I can only answer this from my point of view but bear in mind that I didn’t actually pay for the upgrade. So I didn’t have to spend my hard-earned cash. But, when I have to go long haul again and the option is there to fly Premium Economy, would I pay for it myself? Let’s see. For the separate check-in desks? No. I don’t mind queuing to check-in. Get there early and you won’t have to queue for too long. For the priority boarding? No. That stuff doesn’t bother me. I don’t need to sit on a plane 20 minutes before everybody else when I am going to be on the plane for 12 hours. For the food? No. 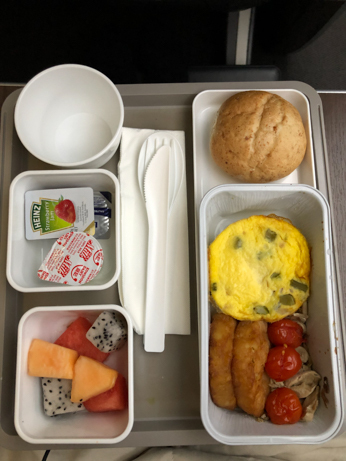 The food is still airline food and it is probably the same quality as the Economy. For the service? No. The staff are absolutely lovely no matter what cabin you are in. There is no difference in the treatment of economy passengers compared to Premium Economy passengers. For the extra leg room and space? It depends. I was quite surprised what a difference this made in how comfortable I was and how relaxed I felt. However, this only applies to the Premium Economy bulkhead seats. I didn’t really notice much of a difference on the return flight when I was in one of the other Premium Economy seats. I can imagine, for someone of my height and build, getting a bulkhead seat in the economy cabin would be just as comfortable and spacious. For the reclining seat? Yes. This made a huge difference to the comfort and enjoyment of the flight. If you are someone who can sleep on planes, this will make your sleep so much better. However, I didn’t actually sleep on the plane. I just couldn’t fall asleep, I never usually can fall asleep on long haul flights. I have no idea why. Even the comfy pillow and blanket didn’t help. However, what I will say is that I was more comfortable on this flight than on any other. For the quiet calm cabin? Yes. The flight was so chilled out and relaxing because of how quiet the cabin crew and other passengers were in Premium Economy. When I went back into the Economy cabin to use the bathroom the noise levels were much higher, as was the stink of beer and wine. However, on the return flight, this tranquil bubble was burst by two screaming kids in the Premium Economy cabin. So even if you spend over a grand on a ticket your flight and sleep still might be ruined by crying children. If I could afford to fly Premium Economy all the time I would. No questions asked. It was just so pleasant. It was so nice to arrive in Hong Kong refreshed and relaxed. 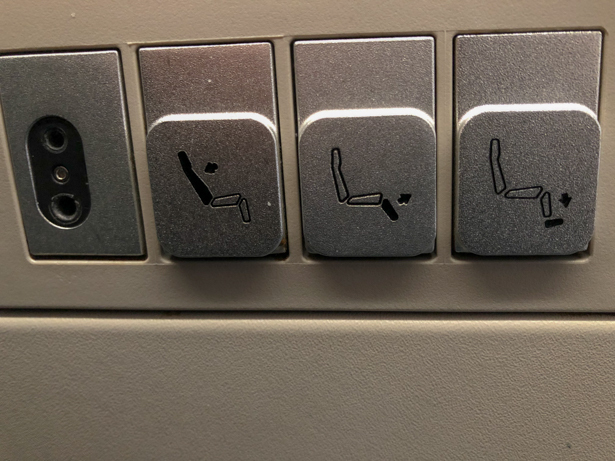 The reclining seats are great for sleeping in and can help prevent or ease jet lag. Sometimes jet lag can wipe a whole day from my holiday so to be able to reduce this is great. However, I am not flush with cash and if I was flying again I probably won’t splash out an extra €500. This is simply down to the fact that I just don’t make enough money to justify it. But as soon as I start earning more money, this is exactly how I will fly for my long haul trips. 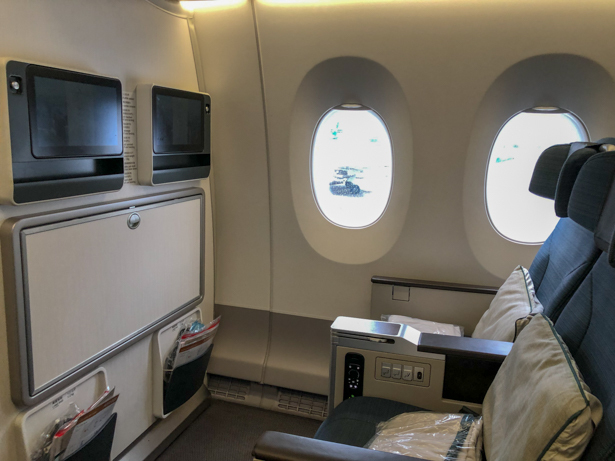 Have you flown in the Cathay Pacific Premium Economy cabin? Let me know how you got on and if you thought it was worth the extra money. Make sure you check out my review of the Cathay Pacific Business Class Lounge in Hong Kong Airport. 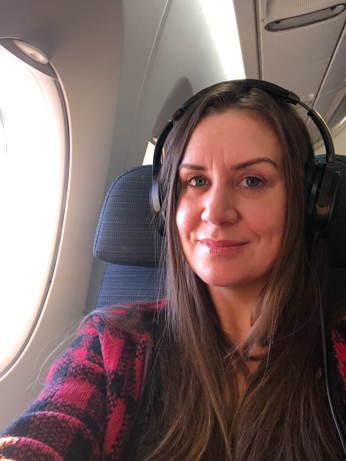 If you liked this Cathay Pacific Premium Economy cabin review, you might also like my review of the Finn Lough Bubble Domes in Northern Ireland. Additionally, you might enjoy reading my Madrid travel guide. Another blog you might like is my review of the W Hotel in Barcelona. 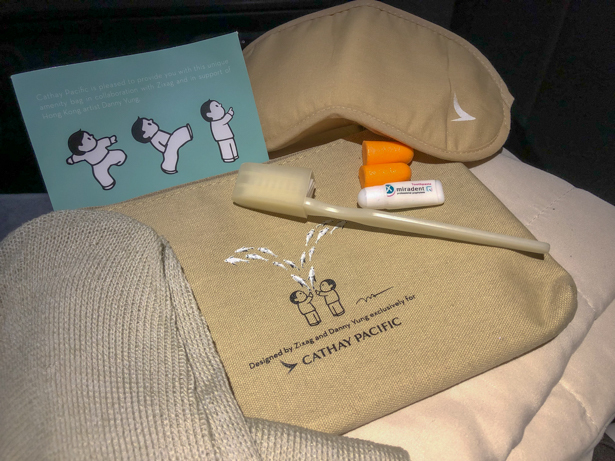 If you liked this Cathay Pacific Premium Economy cabin review, please share with others.